We woke and had breakfast, Michelle eating cereal and me finishing off the last tomato and basil bagel with the Tillamook cheese. I also ate the last banana from yesterday. Our first stop was only a few hundred metres down the street from the motel - a set of factory outlets we had noticed last night when going to the supermarket. Michelle checked the Levi's Outlet while I looked in a book store and then a toy store and found some ultra-cheap Lego, but restricted myself to a small werewolf set for $4.88. They had the Harry Potter Chamber of Secrets set for only $39.99 - half the price back home - but it would have been way too big to take home. Then I went into the Levi's store and looked around but didn't see Michelle. A sales assistant asked if I needed any help and I said I was looking for my wife. She said, "Is she the dog lady?" When I looked blank she added, "I mean, the woman with the dog..." At this point Michelle emerged from the change rooms with a pair of jeans which she bought - for $14.99! Bargain! Finally leaving Troutdale, we headed east on historic Columbia Scenic Highway 30, rather than the huge freeway 84. Route 30 was slower and much more scenic - stopping first at Crown Point Lookout overlooking the Columbia River Gorge. The lookout was being renovated but still afforded a great view both east and west along the river from well above route 84. 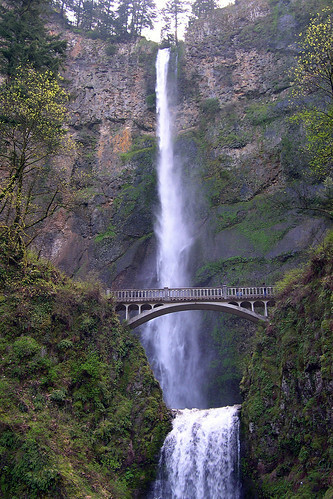 Highway 30 also allowed stops at several waterfalls: Latourell, Bridal Veil, Wahkeena, Multnomah, and Horsetail. We saw all these except Bridal Veil - the trail to which was closed for maintenance. We didn't stop for lunch, as we had enough food with us - Michelle had crispbread and Vegemite and an apple, while I had the salmon jerky from Tillamook and finished off the last of the Cal Yee's dried fruit and nuts. 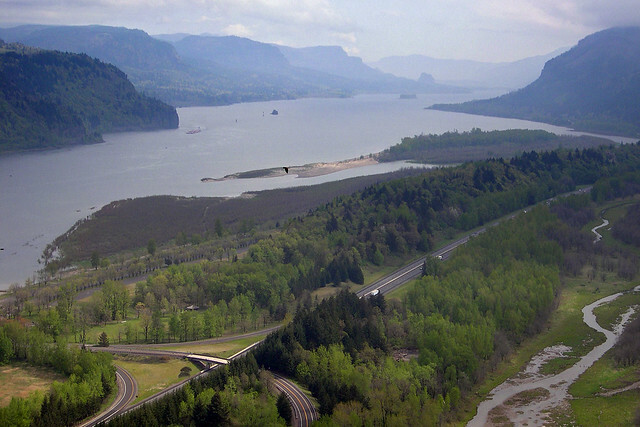 After Highway 30 rejoined 84, we sped along the Columbia Gorge without stopping until we reached Hood River. There we stopped to look at the old History Museum, which had lots of well-presented displays on the history of the region from pioneer days to the present windsurfing days, all tended by an enthusiastic old lady who kept following us around and chatting to us. Then we turned south on to highway 35 to head towards Mount Hood. A short way down the road we spotted the mountain for the first time - huge and imposing and covered with snow. It was amazing, so we stopped for photos. 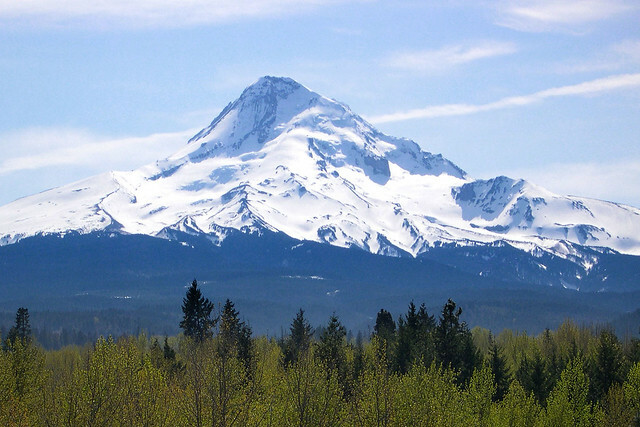 Further down the road we passed the town of Mount Hood and the mountain in the distance loomed right over the main street. We drove on and started climbing higher but the pine forest closed around the road and we couldn't see the mountain any more. There was a lot of snow on the ground between the trees. After a while we gave up trying to get a closer viewpoint because we had to turn around and go back to Hood River to continue our eastward journey. So we turned around and this time stopped at Mt Hood town to get photos and I had an orange. On the way back we spotted another huge mountain in front of us and determined it was Mount Adams in Washington - it was also impressively snow-covered. Back at Hood River we turned on to 84 again and flew along the Gorge to The Dalles, where we crossed to Washington over the river and drove along the more scenic 14 east, stopping frequently to take photos of the changing landscape - from forest we had moved to open rocky crags and bluffs overlooking the river. 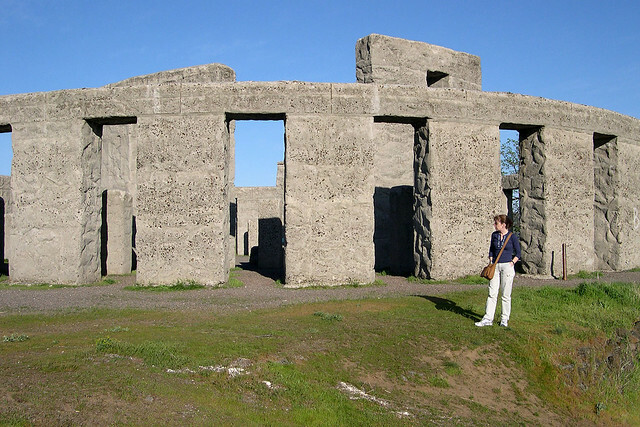 We passed Highway 97 at Maryhill and continued on the short distance to the full-size replica Stonehenge, built of concrete on a clifftop overlooking the Columbia River. It was a truly weird sight, but interesting to see. We drove back to 97 and stopped for petrol. For the first time since California we had to pump our own, only when I squeezed the nozzle handle nothing happened. I gestured at the guy in the station building, thinking he might have to turn the pump on from inside, but he simply gestured back cryptically. After a few more attempts, I figured out that he was pointing me at a lever on the pump that I had to press down in order to get it to work. Refuelled, we took 97 north to Goldendale, where we checked in to the Far Vue Motel, right near the turnoff from 97. We walked two doors down to Ayutla's Mexican Restaurant for dinner, which was obviously popular with the locals as it was very full and doing a roaring trade. Michelle had a veg burrito and I had a chorizo burrito with rice and beans. it was huge and filling as usual. By the time we had finished dinner, the sun was just setting and we had a spectacular view of it over the outskirts of town, with Mt Adams in the distance nearby. We then drove up to the Goldendale Observatory State Park, where we saw a presentation about the history of the observatory and its 24 1/2 inch Cassegrain reflector telescope - the largest amateur-built, publicly accessible telescope of its type in the US. Then the parks guy set up the telescope and let us look through it at Venus and Mars - they were good but very watery and wobbly because of fairly poor seeing. Then we went outside and looked at the stars in the dark sky for a while, spotting a couple of satellites. Then we came back to the motel and turned in for the night. During the day today we heard some lottery ads on the radio - they had a disclaimer: "Lotteries are games of chance and should not be played for investment purposes." Last updated: Thursday, 24 January, 2019; 00:18:27 PST.